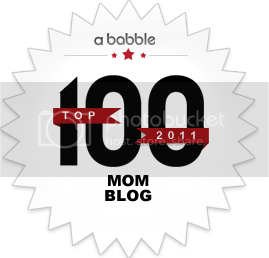 I was recently invited to become one of Scholastic’s Mom Blog Friends which means that every month, I get to review one or two books from their Book Club catalogs. I immediately jumped at the opportunity because I wholeheartedly support Scholastic’s mission. For obvious reasons, I’ll be reviewing books from Club Leo. By the way, if you are not familiar with Club Leo, you’re missing out on a great option to grow your niños bilingual and Spanish home library. This Scholastic Book Club has a diverse selection of books for kids in preK through 6th grade which can be great additions to any bilingual household. I guess I must live under a rock. I had no idea Shakira had written a Dora book entitled La aventura del Día Mundial de la Escuela until I saw it on Club Leo’s Spring catalog. As soon as I did, I knew I wanted to have it. I’ve loved Shakira ever since I first listened to her music back when I was in college — many moons ago — and way before she became a crossover sensation. I was really eager to see how her talent for writing music translated to writing children’s books. I might be mistaken, but it seems as if Shakira wrote the book in English, which I find kind of strange, since not only is it not her first language, but it’s one that she recently learned. Either way, the translation is well done and, you probably know this by now, that’s a big plus in my book. The story follows the path that all Dora’s adventures usually do: there’s some kind of problem and Dora and Boots find a way to come to the rescue. In this case, Dora is celebrating World School Day at her school with the help of Shakira. However, the other schools around the world which will be celebrating with them, are lacking all kinds of materials to start the new school year. So, Dora and Boots come to the rescue as each school decides to share some of their materials with the school which needs it most. My daughter is about to finish preK and will be entering Kindergarten in the fall. We’ve been talking about schools a lot lately and she has a lot of questions about how things work there and what her days will be like. I think she’s excited, but a bit apprehensive about going somewhere new, where she doesn’t know anybody. While the book’s main lesson is to teach children about the importance of sharing — something which little ones have such a hard time doing — I enjoyed reading Shakira’s book to my daughter because it features different types of schools around the world. The story includes a tree school in Ethiopia, a school in a bus in India, and a boat school in Cambodia. Vanessa was really intrigued by all this and even after we were done reading the book, she wanted to know more. The story also gave us an opportunity to talk a bit about our world map and where each of these countries is located. I only wished Shakira had included at least one country in Latin America. I think that would’ve made the book complete. I wonder why she didn’t? 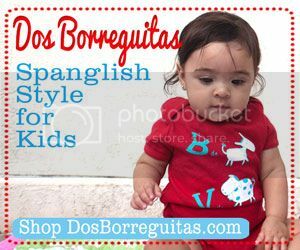 But the best thing about the book for me is that part of the proceeds from the sale of this book will go to Shakira’s renowned Pies Descalzos Foundation dedicated to childhood education. We’re giving away a copy of La aventura del Día Mundial de la Escuela by Shakira. To enter this giveaway, please take a look at Club Leo’s Spring catalog and leave a message letting me know which book you’d like me to review next and why. This giveaway ends at midnight EST on Sunday, May 15, 2011. Entries/Comments that do not follow the submission guidelines will be invalid and automatically deleted. Sorry, just need to keep it fair. Good luck to all! Disclosure: Scholastic provided me with a copy of the book to review. All opinions are my own. I would love for you to review the Clifford Trio. My son loves Clifford and if we could get more books about Clifford in Spanish, he would really enjoy them. He loves Dora too (and dancing to Shakira- he’s part Colombian!) so I hope we win! “Cantaba la rana”…anything with music. Trabalenguas zoologicos– It peaks my interest… I’d love to hear your impression:) I also agree with Nydia, Cantaba la rana would also be a great pick! I would love for you to review Higher! Higher! Mas Alto! Mas Alto! because my daughter is graduating from kindergarten. I would like to know if it has a cute message about achieving what you want. Wonderful opportunity and long overdue. The Lion and the Mouse – because I think fables are a wonderful way to teach life lessons. I love Scholastic and my kids loved Dora when they were younger. That’s weird yet cool that Shakira wrote this. I’d like to win the book for my new niece since my boys are too old now. The next book I’d like you to review would be Diario de Greg. My kids love Wimpy Kid books and I’ve never seen them in Spanish. Would love to know how good the translation is. I’d love to see a review of Mas Alto! Mas Alto! I’ve seen it in the bookstores, but have never picked it up. It sounds like something my daughter would say. I would like to see the disney fairies pack as my little girl loves them. Me encanta Club Leo! I use to order from them when I worked full time in the class room, I need to start ordering again. 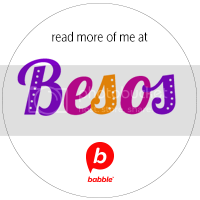 Anyway- glad to know you will reviewing books, always nice to know what others think before getting a book- so I would love for you to review the ¡Listo, Calixo! Catastrofe en el Camamento. My kids would totally love this- since we did just go camping this past weekend. Collecion Libros ecologicos (Green pack). Great books to teach children to take care of our planet. I hope you pick my book. I love Club Leo! My mom and I have ordered several books over the school year for my son and daughter. 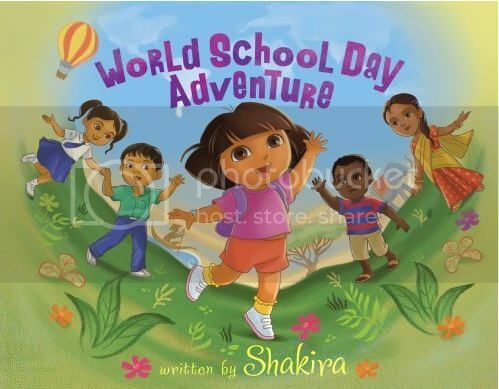 I had noticed World School Day Adventure had been released but I had not noticed that it was written by Shakira . . . as for books I would like you to review, I would like to know what you think of El Autobus Magico: Planta Una Semilla and Fuera, Hombre Mosca! My son already enjoys the translated books of Dav Pilkey such as Uuk & Gluk but I would like to know how the other chapter books translate and if they are as good a read as in English. 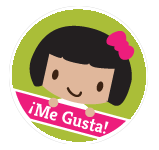 I would also like your opinion of the My First Bilingual Little Readers: Level A as I am always on the lookout for books for my daughter who is learning how to read. Thanks so much! Υоu should be a part of a contest for onne of the greatеst sites online. I will hіghly recommend thiks weƅ site!